Create beautiful sand art statues. Fill them with fine or coarse sand, sold separately. For extra flair, add glitter to the sand mix. Create beautiful sand art statues with these great bottles. Fill them with our fine or coarse sand (sold separately) for a one-of-a-kind creation. 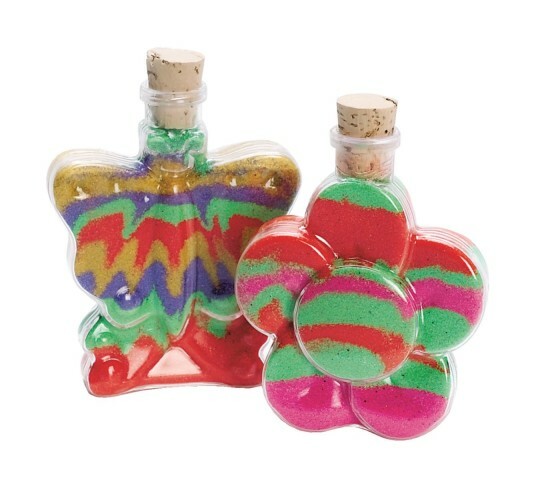 For added flair, add glitter to the sand mix. Perfect as a fun group activity. Includes corks. Each bottle is 3" to 7" tall and holds about 6 to 10 oz. of sand. Pack of 6.